Terry, Judy, Ben & Meredith Thornton all work daily in the store to ensure you receive the quality and service you deserve. We carry a huge amount of inventory in our 36,000 square foot fully-accessorized showroom and adjacent 8,000 square foot warehouse. That means you can shop today and, in most cases, take it home today. Or, you can have your purchase professionally delivered by our in-house delivery service within a few days. There’s no need to wait weeks or months, no possibility of backorders or shipping delays, no third-party delivery firms to contend with – browse the showroom, make your selection & take possession – it’s that easy! We sell quality home furnishings at the absolute lowest price possible, backed by professional service and our stellar reputation. We know you can purchase at any number of places, in-store and online. That’s why we are focused on having the sharpest prices every day. You will not find a better price on the identical item, with a comparable level of service, in-store or online. 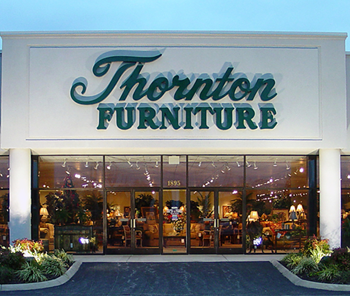 We are members of Furniture First Buying Group, a nationwide cooperative of 496 independent furniture stores with over $2 billion in group buying power. We receive the best price from our suppliers so you receive the best value from us. If you think you’ve found a better deal, please let us know – we’d love to help you compare and would greatly appreciate the opportunity to earn your business! We shop the largest home furnishings markets each year, searching for the latest fashions by the world’s finest manufacturers at the best value. We also visit our suppliers’ manufacturing facilities and showrooms routinely to see the latest products and manufacturing techniques. Can’t find exactly what you have in mind or want to express your personal style? We specialize in creating furnishings that are designed by you and constructed to perform well in the specific conditions of your home. In fact, almost 50% of our business is custom order. In upholstered furniture (sofas, chairs, etc. ), we work with some of the best in the business: La-Z-Boy, Craftmaster, Huntington House, Bernhardt, Sam Moore, Rowe, Robin Bruce, Fairfield and Jonathan Louis. These companies offer a seemingly endless number of frame styles, hundreds of leathers, thousands of fabrics and dozens of wood finishes to choose from. In custom dining furniture, SELECT by John Thomas Furniture allows you to choose the size of your table, style of your chair, 64 finish options and more. In bedroom furniture, we offer the custom Artiste program by A.R.T. Furniture. Choose from dozens of beds, dressers, chests, etc., select your finish, and pick the style and finish of your hardware – custom-designed bedroom furniture by you for your home. We have professionally trained sales consultants and designers that have been with us for years. Each one is highly-qualified to assist you, taking your vision for what you desire your home to be and making it a reality. We encourage you to bring pictures of your space, room dimensions, paint and flooring samples, cushions or pillows from existing pieces – basically anything that will help us visualize your space. For challenging and large-scale projects, ask about our FREE in-home design service. Our delivery team is prompt, experienced and courteous. Once you’ve made your selection, our team will deliver and set-up your purchase so that it looks exactly like the item displayed in our showroom. We don’t use a third-party delivery service – our staff using our trucks, handling your items from start to finish. We routinely deliver to the following cities: Franklin, KY – Glasgow, KY – Louisville, KY – Owensboro, KY – Russellville, KY – Clarksville, TN – Franklin, TN – Lebanon, TN – Nashville, TN.